We officially have our first book club selection of 2017. What are we reading? 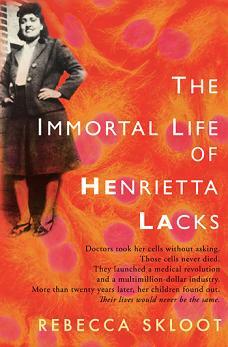 The Immortal Life of Henrietta Lacks by Rebecca Skloot! Why choose a nonfiction book? Don’t we normally revel in our fiction selections? Oh yes, we do. That is true. But we are also a science-loving bunch. And Skloot’s book, although nonfiction, reads like a story, a real page-turner. Skloot’s account of the cells and research that were so influential in the development of modern medicine, vaccinations, and cancer treatments is unique among the many papers that have been published about HeLa. She focuses on the woman behind the science, including what is known of her personal history, her family story, and the legacy of her life. And it is a fascinating story. As you read, consider the following questions. What are the ethical ramifications of scientists using Henrietta’s cells without her consent? How has this decision impacted medicine today? How did race relations in Baltimore impact the process of Henrietta’s treatment and subsequent research conducted using her cells? How did education impact the same? How would you characterize the relationship between the Lacks family and the doctors at Johns Hopkins? What do you think would happen in today’s world? Are there any similar ethical dilemmas facing scientists or academics? Join us for our discussion on May 29th!